AAE's newest property just completed renovations and offers free Shuttle to most Themeparks! Brand new beds and more. Only $1.75 from Amtrak and Greyhound Stations via public bus. Our clean and cozy rooms all include private bathrooms, free Wifi, fridge, large pool with beach entry, free parking and so much more! The entire property has been renovated with modern features to make your stay spectacular. Discount coupons and rates available from AAE site! 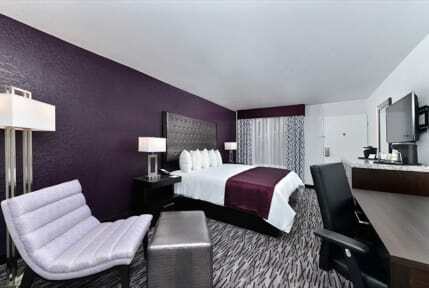 AAE Clarion offers you an incredible location for visiting Orlando! Situated right outside of the Universal, and Island of Adventure gates, our free shuttle also takes you to all theme parks of interest including Universal, Disney World, Magic Kingdom, Epcot and Seaworld! You can also use the free shuttle to access the Orlando Convention Center next to DisneyWorld! If you are looking to mingle with other guests, our HUGE on site pool with beach entry Also enjoy our on-site restaurant and bar. Each guest room is equipped free wifi, hair dryer, alarm clock radio, smoke alarms, electronic door locks, 40' Color Cable TV with remote control and Pay per view movies; direct-dial telephones; individual climate control and in-room safes. 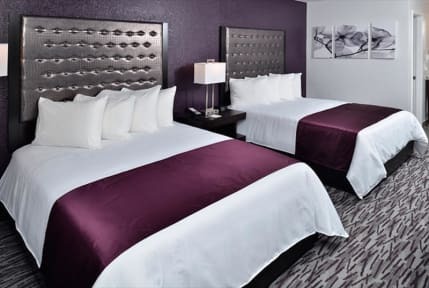 All guests of 2 or more people, will be placed in rooms with 2 Queen Size Beds. Getting here is easy and is a cheap $1.75 ride on Lynx to us from Greyhound and Amtrak Stations. Airport bus drops you one mile from our property. Please note: Local taxes of 12% and $2.44 amenity fee are not included in these rates. We have stayed here 3 Years in a row. We will be back next year. Very friendly staff. Very clean rooms. Thanks toeveryone who made my stay so pleasant. A special thanks to the two ladies on the front desk who assisted me when they could sense l needed support with my very limited computer knowledge. You certainly saved the day as the documents wete essential to obtain. All staff greeted guests so cheerfully and the house keeping staff assisted promptly with any requests. Wonderful stay. I loved this place. My only concern was there was no shuttle to the airport. It is a clean hotel, staff are lovely, close to universal parks but do need to get a taxi as you can’t walk because of motorways, and it was a 35 minute taxi to Disney parks. I loved the fact they had a pool AND a hot tub. I also made use of their laundry room which is good for travellers. The issue I had with the fasciitis was the toilet didn’t flush well which we had to get fixed, and two out of three plug sockets didn’t work - not with our chargers and not with the hotel lamp. Overall: good. Great location. Clean and neat. Rooms don't have microwave which is a downer compared to the cost of the rooms. Great location overall. Hostel world stole my money SCAM ALERT !!!!!!!! !SCAM ALERT !!!!!!!! !SCAM ALERT !!!!!!!! !